We close our our Kokohead trail series with a picture of Hanauma Bay as viewed from the summit of Kokohead. The pristine protected horseshoe shaped bay is a protected marine life conservation area and underwater park. It is also one of Oahu’s top visitor attractions. 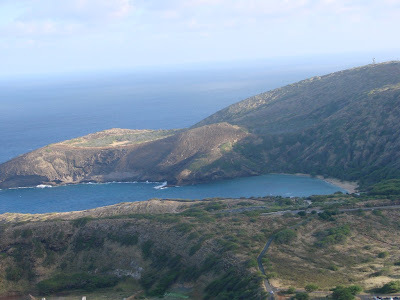 If your visiting the islands and like to swim or snorkel be sure to make a visit to Hanauma Bay. 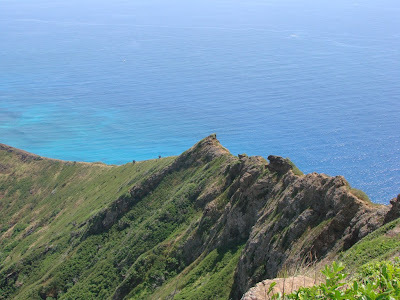 If you want to see an earlier write up I did visit my Kokohead adventure page. Here is the view of the ridge line from the summit of Kokohead. Viewed from the Hawaii Kai side its easy to forget that kokohead is a crater and not just a mountain. This stunning view shows the ridge and its spectacular view of the Pacific Ocean. At the summit there is a metal platform once used for the rail cars that you can rest on and which also provides a perfect view. 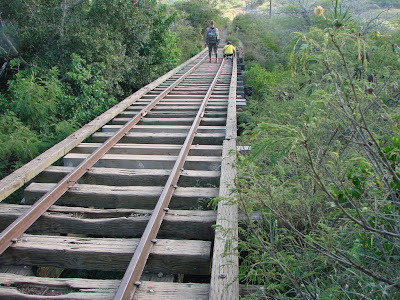 A little over halfway up Kokohead you come across this wooden bridge which is several feet off the ground. Personally on hikes I always like some sort of obstacle like climbing over a fallen tree or using a rope to pull yourself up a steep incline, it just make it seem more like a hike. People with good balance can just walk over the bridge though many people stay low to the bridge and hold on. Of course a few turn back unwilling to traverse this obstacle.